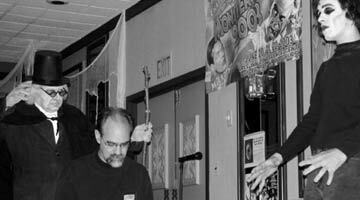 The 2003 Monster Bash featured Guests of Honor Sara Karloff, Kevin McCarthy, Ben Chapman, Julie Adams, Cortlandt Hull (Werewolf of London descendant), Bob Burns (1950s Sci-Fi/Our favorite Ape Man! 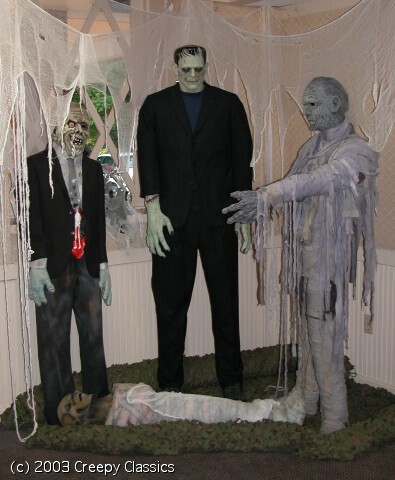 ), Tom Savini, Frank Dello Stritto, Vlad and Creighton from Ghoul A Go-Go TV and many more. What a time! The Bash rolled on with great guests and a real fun time. Some quick little visions that are still flashing in my head: seeing someone dressed up like "The Fly" in the hallway, radio coverage on CNN network news, Paul Harvey radio news, AP wire on newspapers across the country, seeing the great on Chamberlin make-ups with little scenerios we did on stage. The Mummy choking the High Priest of Bash (Bill Miller) on stage with my wife as the reincarnated Ananka, The Werewolf of London chasing my sister, Ron himself as Uncle Boris from MAD MONSTER PARTY, Ron Chamberlain and Thom Subila as the characters from THE CABINET OF DR. CALIGARI with the great new score performed live by childhood friend Kevin Slick! A pensive (amazingly) moment from Ben Chapman who played the CREATURE FROM THE BLACK LAGOON back in 1953-54! 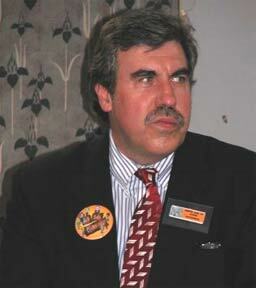 William Max Miller as the High Priest of Bash direct from the Hil of the Seven Jackals! Kevin Slick performs his new score to the 1919 CABINET OF DR. CALIGARI. 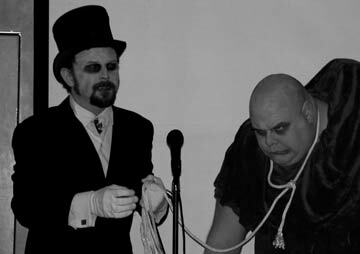 Great make-ups by Ron Chamberlain (as Caligari) and Thom Shubila (as Caesar, the zombie). 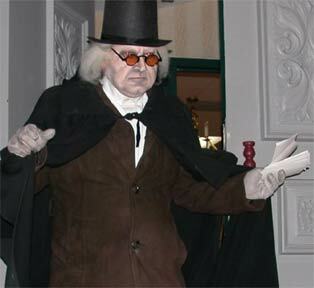 Ron Chamberlain as Dr. Caligari! 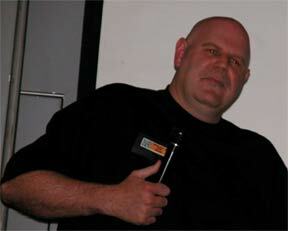 Cortlandt Hull (of the Silver Screen Movie Museum) giving a presentation on make-up through the year for cinema. 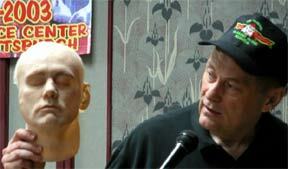 Don Reese, stand-up comedian, who has apeared on A&E's Improv show, does stand-up comedy tied in with classic movies! 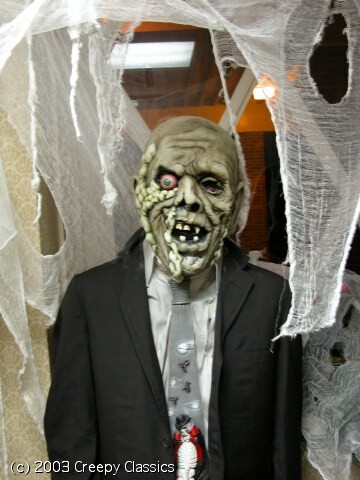 From the lobby of the Monster Bash hotel...Dorian Gray, courtesy of Jerry Armelino! 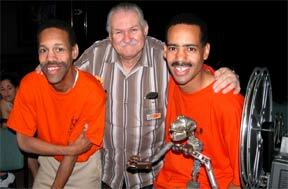 Prop collector Bob Burns with Bash staffers Eddie and Geoffrey Curtis...and the skeleton of King Kong from 1933. 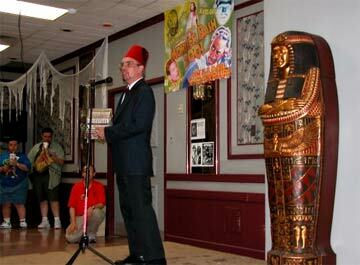 Author Frank Dello Stritto discusses "The Mummy Through the Ages!" 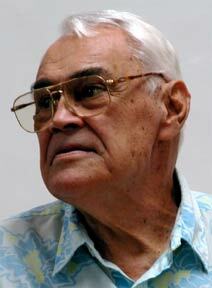 from his new book. 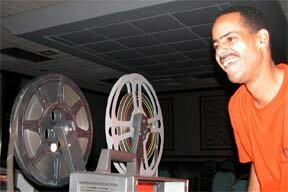 Geoffrey Curtis at the projector. Those wild and creepy guys from the "Ghoul A Go-Go" TV Show! Emmy Award winning make-up man John Goodman at the Bash! 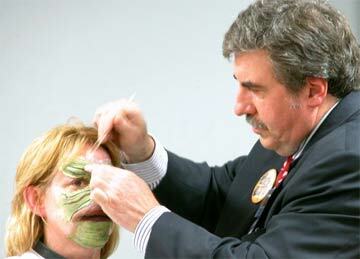 John Goodman giving a make up demonstration on stage at the Monster Bash! 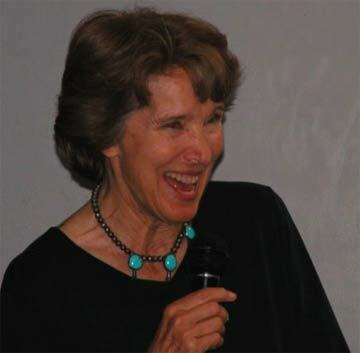 Julie Adams (CREATURE FROM THE BLACK LAGOON) entertains during a Question and Answer session with fans. Kevin Slick getting ready to perform his new score for CABINET OF DR. CALIGARI! 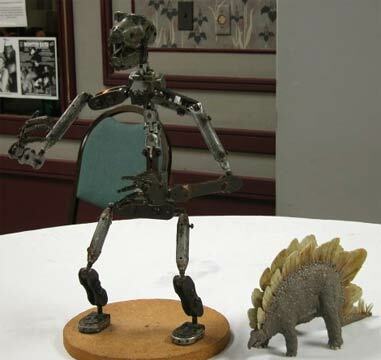 The real KING KONG from 1933...what;s left of him and a onderful Stegasaurus model by artist Jary Lesser! 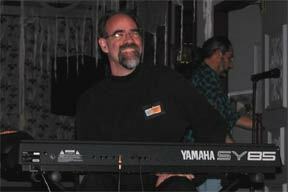 Kevin McCarthy (hamming wonderfully!) 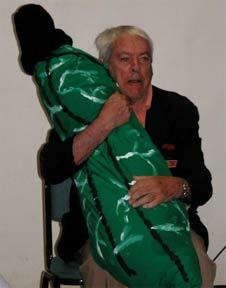 and pod from INVASION OF THE BODY SNATCHERS on stage at Monster Bash! 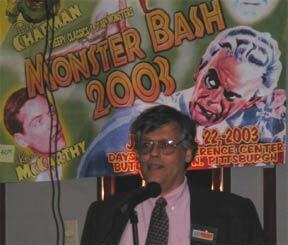 More Photos from Monster Bash 2003 - CLICK HERE! PHOTOS courtesy of Sam Minter, Barb Heiss, ...and many others...thank you!